we bring the kingdom come. I heard that song lyric for the first time today, and God floored me as I was headed in to work. For years, I have felt guilty or ‘less than’ for not being an evangelist, or walking up to random strangers and proclaiming Christ out loud. This line….God used it to reveal to me that when I smile, and offer a glimpse of hope, His kingdom comes. 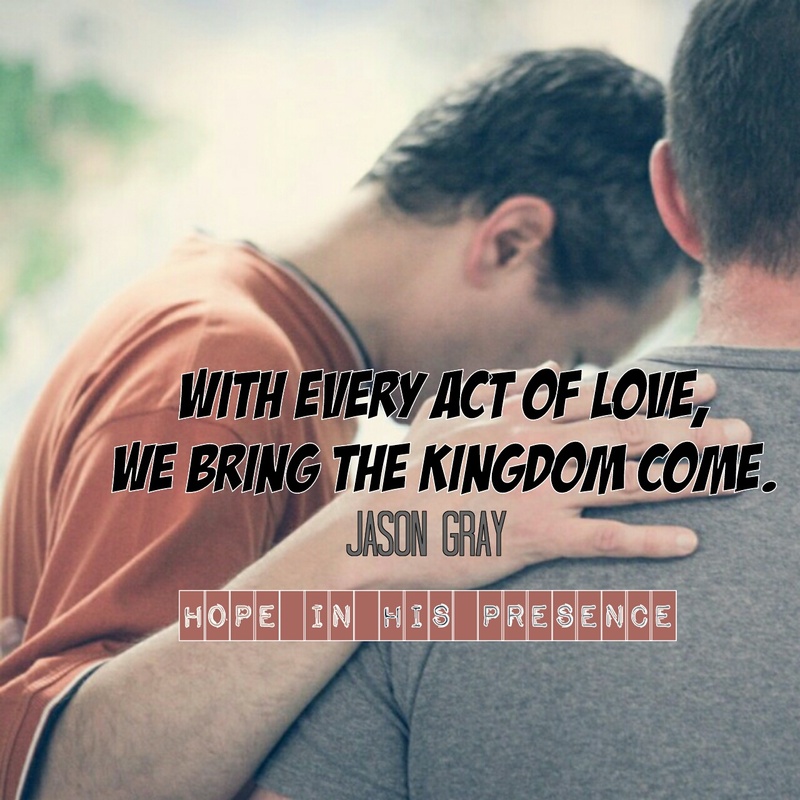 When I help a friend, coworker or stranger in need- His kingdom come. When I sing and invite His Presence to invade whatever space I am on, His kingdom come. When we use our gifts & talents for His glory, His kingdom come. Why oh why do we complicate what Jesus clearly showed us? God reminded me we can all be as Jesus was when we remember to love one another. His love was the conduit for kingdom come. His love was the key to releasing His power. Its no accident that Mark recorded Jesus’ words about love. We are marked by His love. And that love is to be evident to those around us. When we love one another with His heart, His kingdom come. You and I? We are an important part of God’s plan to bring His kingdom down to earth. What a timely reminder for me, that Jesus is my example for how to love others. Let His kingdom come! Amen Crystal! May more of His Kingdom love rise within us so we can love with His heart. Hi Karla, visiting you from #IntentionalTuesday. It’s so easy to get caught up with thinking that in order to share Jesus we have to do it in a way that screams “I am an evangelist.” Thanks for reminding us all we need to do is show his love.